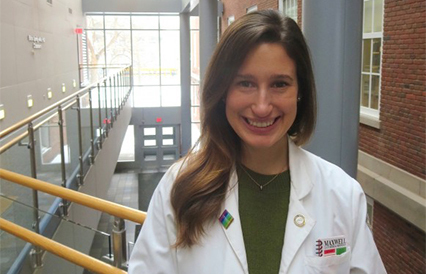 Jordana Gilman, an MD/MPH student, is collecting and analyzing data on hundreds of pregnancies in Syracuse from 2014 to 2016 to help make a case for better birth outcomes. Gilman is a proponent of a form of family planning called immediate postpartum Long Acting Reversible Contraception (LARC), which involves placement of an IUD within 10 minutes of the delivery of the placenta. Gilman said there is ample evidence showing immediate postpartum LARC is safe and effective at lengthening the interval between pregnancies, decreasing elective termination rates and improving the health of mothers and babies. The American Congress of Obstetricians and Gynecologists recommends immediate postpartum LARC placement as the most effective option for postpartum contraception. And the U.S. Centers for Disease Control and Prevention cite immediate postpartum LARC as the primary cause of the decline in the repeat teen birth rate since 2004. Immediate postpartum LARC is an alternative to other postpartum contraception methods, including abstinence and Depo Provera injections (which last 12 weeks). In some cases, contraception isn’t offered until the mother’s followup visit when the baby is six weeks old, but Jordana cites a study showing 24% of local patients miss that appointment, mirroring national rates. Along with that no-show rate, many women resume sexual activity before the six-week postpartum visit. Placement of a LARC in the delivery room is desirable because the woman has just delivered a baby and likely does not want to become pregnant again soon, Jordana said. There are risks and potential complications with immediate postpartum LARC. Some women report irregular bleeding and discomfort, and the IUD can unintentionally be expelled. Physicians must be trained and certified in LARC insertion. There are upfront costs associated with the procedure, but Medicaid started covering the costs of LARC in 2014, and managed care plans followed in 2016. Her principal investigator on the project is Renee Mestad, MD, division chief of Obstetrics and Gynecology at Upstate. Mestad has offered to train and certify providers at Community Hospital in device insertion, Jordana said. Gilman is from Rochester, N.Y., and graduated from Cornell University in 2014 with a bachelor’s degree in human biology, health and society.